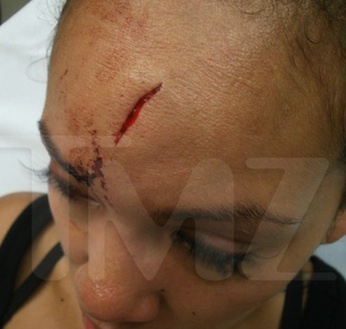 For instance, TMZ just released photos of Basketball Wives star Evelyn Lozada with a nasty injury following last year’s headbutt by her ex-husband, NFL star Chad “Ochocinco” Johnson. Many know Chad as that quirky, handsome, center-of-attention guy in a tiger-striped jersey who always kept the media on their toes in press conferences. 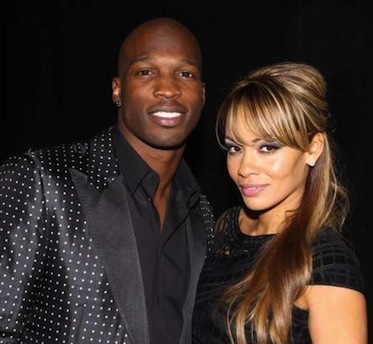 The guy who slapped his male lawyer’s boo-tay in court and the centerpiece for VH1’s moderately successful dating show, Ochocinco: The Ultimate Catch. I can see how he would sound like a catch, but as you can see from that cut on Lozada, he’s not. I think it’s f*cking scary that 85 women were vying for the attention of someone who would inevitably leave them physically and mentally scarred, and even scarier that there are hundreds of thousands of women living on edge because their partners have no control over their fists during the simplest of arguments. 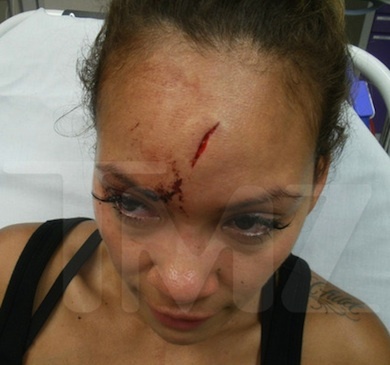 Left to right: Evelyn Lozado just months after marrying Johnson (July, 2012), and Rihanna in 2009. The only real consolation is that the winners of reality shows like Rock of Love and Ultimate Catch never truly end up with the d-listers they’re competing for. Those not hired by former music networks are completely out of luck. Amen. Protection. There are plenty of decent guys out there who won’t hit you. They may not do the dishes or buy you diamonds but they won’t destroy your face, mind and body. Yeah. As stupid and ignorant as that opinion is, it’s really common and nearly impossible to “fix” once it’s embedded in the brain. Also, it’s one thing to screw yourself over because of poor self-esteem or masochistic tendencies (like Chris Brown fans), but you’re in a whole other ballpark when kids are involved. In other words, no one’s going to feel sorry for you when the neighbors call CPS.